Jane approached us with a requirement for a bespoke modern carport at the front of her property as Jane wanted to protect her cars from bird faeces, falling debris from the trees and snow in the winter. Our bespoke modern carport was perfect for Jane as she wanted something structurally sound, modern, substantial and stunning in appearance. Jane decided that we were the company for her as our bespoke modern carport could be specifically designed to span the width required and fit the space perfectly. After conducting a site survey with Jane at her property we knew that we would need varying concrete footings, cranked posts on the right-hand side, and also a gallows bracket on the post to allow the carport to protrude past the wall without a post in the way. The carport actually tapers from back to front as well, which added to the list of bespoke requirements – not a problem for our team. Once we had worked with Jane and our designers to achieve what Jane desired, everything else fell into place. The nature of our bespoke modern carport meant that Jane knew even though we had to change the design of the bespoke modern carport, it still remained stunning and structurally sound. Jane signed the final drawings off and wanted the structure to be powder coated in RAL 9005 Jet Black. This colour appealed to Jane as it would compliment and provide modern contemporary aesthetics. Jane chose clear polycarbonate for the roof glazing in order to allow as much light as possible into the bespoke modern carport. Once a manufactured date had been confirmed, the installation team arranged a suitable date for the carport to be delivered and erected. Installation of the canopy was straightforward, partly due to easy access to the site and the amount of space available. 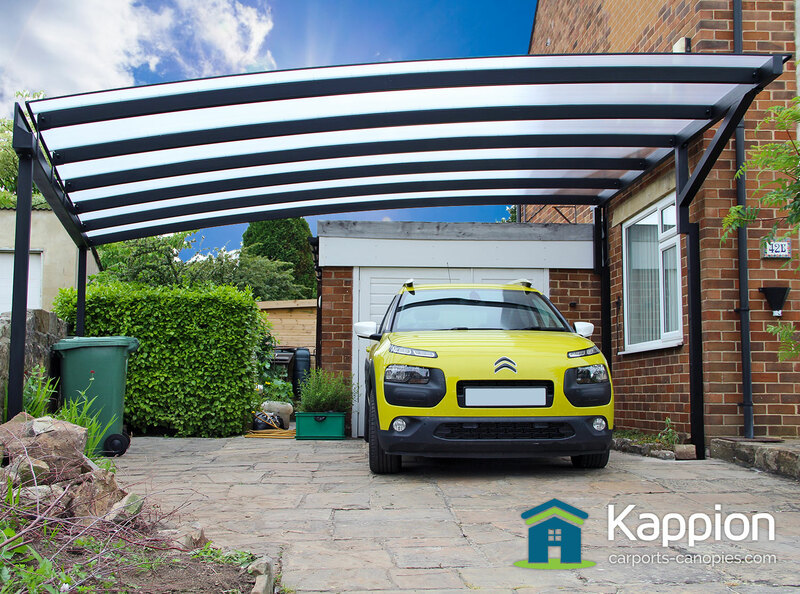 The Kappion fitting team were efficient and using all of their experience and expertise, the carport was installed in just one day. Once installation was finished, we had a final wipe down and hand over with Jane, who was extremely happy with the finished product.